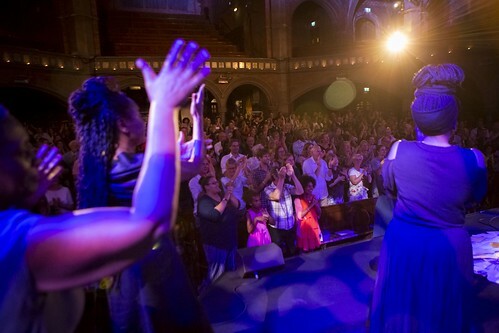 On 17 July 2018, English PEN was honoured to host Celebrating Nelson Mandela: His Letters, His Legacy at the Union Chapel in Islinton. The event marked the centenary of Nelson Mandela’s birth and the publication of The Prison Letters of Nelson Mandela, published by Liveright. The event was directed, produced and hosted by the acclaimed performer and director Josette Bushell-Mingo OBE. A selection of Nelson Mandela’s letters were passionately read by a group of wonderful writers from the UK and South Africa, including Jay Bernard, Jackie Kay, Kwame Kwei-Armah, Ben Okri, Sahm Venter (editor of the collection), Zoe Wiccomb and Gary Younge. Award-winning composer Errollyn Wallen MBE performed a new piece of music inspired by the letters, composed especially for the event. We were honoured to be joined by H.E. Nomatemba Tambo, South African Ambassador to the United Kingdom, and by Zamaswazi Dlamini-Mandela, grand-daughter of Nelson and Winnie Mandela. The entire event is now available to listen to online on SoundCloud or via the player above. Photographs of the evening are available on our Flickr page (credit: George Torode). English PEN is extremely grateful to Lucy Astor, whose very generous donation made the event possible. The London news media gave extensive coverage to the event. Josette Bushell-Mingo and Errollyn Wallen were interviewed on BBC Radio Inspirit with Jumoke Fashola. London Live interviewed Josette Bushell-Mingo the day before the performance and reporter Eleanor Cunningham attended the event and interviewed both Zamaswazi Dlamini-Mandela and Sahm Venter for their news broadcasts.